Doesn't that orange and turquoise look awesome! Love them too, what a great colour and arragement. Hi Kellie, I am with you! they look just gorgeous!! my favorite shade of green! Still hanging out for your shop to open hun!!! got my credit card all ready to go! Now that's different but very, very clever use of colour. that chandelier! Ahh Dying! Love it! Terrific color scheme - never would have pulled these plates and colors together - love it! Lovely and fresh looking, Kellie. And putting up those plates would not be a job for the tipsy. ...plates? I love the colors in the room even more, and that china cabinet, WOW! Those plates arround the mirror are gorgeous! Lovely pic! Hey I missed something here! So many beautiful images on your blog today! I loooooooove the bed linens! Are you selling that gorgeousness? Ha, I didn't even notice the plates! I was struck by the couch/chair combo. Great room either way! yes! and the red chandelier!! That's a great way of using them! A great color for that room too! 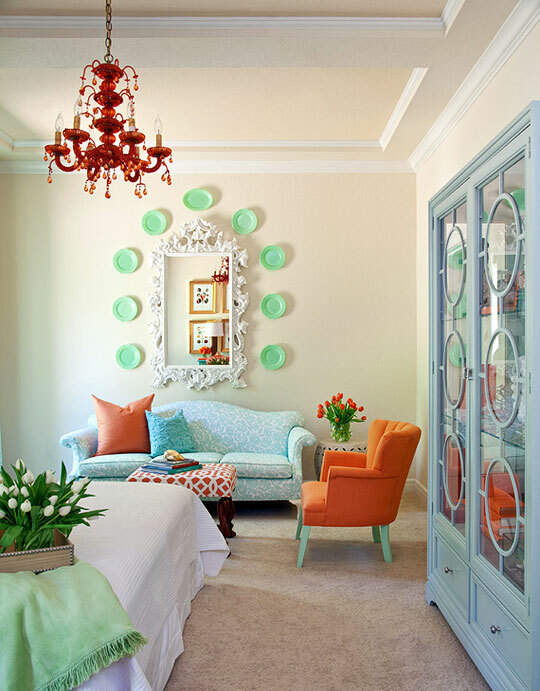 Orange, red and mint- I am LOVING this decor. It's a lovely idea, the way those are wrapped around the white frame. love this idea, super cute!!! this room is stunning, fantastic mix of color and pattern. The plates are great but I am really loving the sofa! I agree, gorgeous green plates. They would be a great pop of color in a neutral room, too!